The Generalized Bedrock Geologic Map of the Helena Area, West-Central Montana (plate 1 in the report) provides an intermediate-scale overview of bedrock in the Helena area. The geologic map has been compiled at a scale of 1:100,000 from the most widely available sources of geologic map information (see index to geologic mapping on pl. 1). That information has been updated by M.W. Reynolds for this report with more recent geologic mapping and field revision of published maps. All well locations and all bedrock units penetrated during drilling have been confirmed on geologic maps at the largest scale available. Source geologic maps are all at scales larger than 1:100,000 scale. Care has been taken to ensure accurate representation of the original geology at the compilation scale. However, positional accuracy of some features might be somewhat diminished at the smaller scale of the base map when compared with the original data source. Also, line thicknesses for contacts and faults necessarily assume a greater width, relative to the real geologic feature, at the scale of the generalized map than on any original map. The map is not intended for large-scale, site-specific detailed planning. Bedrock units throughout the Helena area are generally covered by young surficial deposits such as alluvium, colluvium, glacial debris, or windblown sediment. Thickness of such deposits varies from veneers through which the underlying bedrock is clearly discernible to major thicknesses that conceal all underlying bedrock and structure. Boundaries of major accumulations of surficial deposits are attributed separately from bedrock contacts. These boundaries should not be considered precise at the map scale or at larger scales. Boundaries shown may be less accurate positionally than bedrock contacts and faults because (1) surficial deposits commonly thin to a knife edge; (2) different mappers will interpret the edge differently when drawing a boundary; or (3) the original geologic map maker was concerned principally with bedrock units and structure and thus overlooked, or did not originally map as consistently, some surficial deposits. Veneers of surficial sediment, when saturated, can be local sources of recharge to underlying bedrock. Use of the generalized map to define their distribution does not substitute for site specific mapping of such deposits. Specific knowledge is needed to determine the water-bearing properties of the geologic units at and surrounding a site because the units, including the igneous and metamorphic rocks, have internal differences in stratigraphy, composition, mineralogy and grain size or crystallinity. These differences, together with structural imprints such as faults, folds, and the spacing, orientation, degree of openness of fractures, and extent and type of mineral filling in fractures and faults, all affect the ability of rocks to store and transmit water. Refer to the Metadata file for more information. Thamke, J.N. 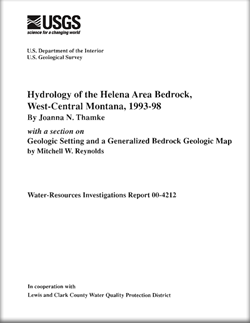 and Reynolds, M.W., 2000, Hydrology of the Helena area bedrock, west-central Montana, 1993-98; with a section on geologic setting and a generalized bedrock geologic map: U.S. Geological Survey Water-Resources Investigations Report 00-4212, 3 plates.